Google Shared Endorsements: Is the Eric Schmidt Photo Protest a Real Thing? 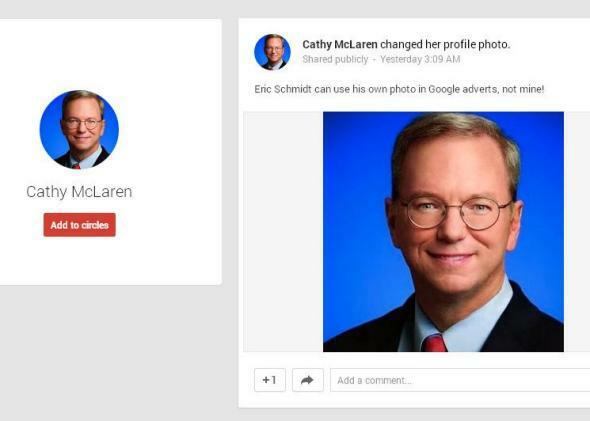 Are people really changing their profile photos to images of Eric Schmidt to protest Google’s new ad policy? It makes for a good headline and a quick chuckle. After Google announced on Friday that it will start putting people’s names and faces into online ads, some Google+ users decided not to take the news lying down. The few who use still use (sic) Google’s Facebook clone protested the move by switching their Google+ profile pictures to images of the company’s executive chairman, Eric Schmidt. The effect? Now, when strange personal endorsements show up across Google, it will be Schmidt’s face hawking a local bar or “Duck Dynasty,” not theirs. No, not really. Marketing Land’s Danny Sullivan, a longtime industry watcher, was surprised by the headlines, because he’s a regular Google Plus user and hadn’t noticed any Schmidt faces in his timeline. That’s odd, because when there’s a real mass profile-changing movement—like when people changed their Facebook profile photos to equal signs for marriage equality—it’s pretty hard to miss. So Sullivan went looking for examples, conducting searches on the site for “Eric Schmidt photo” and the like, and came up with a total of about 50 examples. Fifty. I searched the site myself, and found far more instances of people posting the BBC, Guardian, and Huffington Post stories than actually changing their profile photos. It’s hard to say exactly how many active users Google Plus has, but reports range from the millions to the hundreds of millions, depending on how you count. There is no way of counting, as far as I know, that supports the Huffington Post’s assertion that only a “few” people “still” use it. By almost every metric, the site’s active user base continues to quietly grow—and the proportion of users changing their photos to Schmidt’s mug rounds to zero. There’s one very good reason for that, which is that there exists a far, far simpler way to protest Google’s new policy: just opt out.